Hey there, and welcome to my in-depth review of Frontpoint home security. Back in 2016, after having recently moved in to a new home, we were in the market looking for the best security system to set up. We live in a pretty safe area, but we want peace of mind 24/7. Frontpoint immediately popped up as the #1 recommended choice, and after reading many Frontpoint reviews online and talking to a Frontpoint sales/support rep (877-959-9806), we went ahead and signed a 36-month contract for the Ultimate Plan to get the lower monthly rate, all the features I wanted, and several hundred dollars off our equipment costs. In this Frontpoint review, we’re going to reveal why this company is leading the market, and why it’s worth considering to protect your home and family. Try to find people saying bad things about Frontpoint. You will find them, but it won’t be easy, and you’ll find way more positive than negative. …because Frontpoint puts customers first, and actions speak louder than ads. 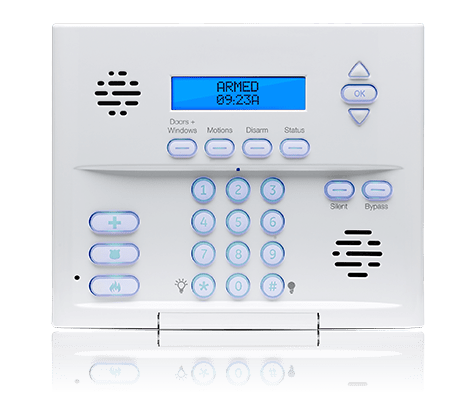 At Home Security List, customer satisfaction and business practices are very important factors in our review process for home security solutions. In their annual survey, 96% of their customers recommend Frontpoint. Frontpoint backs all your equipment with a three-year warranty so if anything stops working, Frontpoint will quickly send you a replacement quickly. You start with a 30-day risk-free trial to set up and experience living with the system. If you decide it’s not for you, you can simply return it for a full refund. Frontpoint will never get you stuck in awkward situations or shady contracts. While we did choose the 3 year contract to get the biggest discount, you can easily go for a shorter one-year contract if you wish to test the waters first and possibly do a longer contract later. 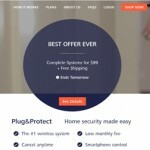 I think Frontpoint’s fresh approach to home security contracts is one of the reasons they have so many positive reviews. It’s an approach that works well for both the company and the customers. Protection Plan: The most basic plan that includes 24/7/365 professional monitoring, but not much else. The plan covers all sensors and is designed for monitoring fires, break-ins, medical emergencies, etc. It sends immediate alerts to the monitoring center if the sensor is triggered, which is one of its best features that will provide complete peace of mind. Interactive Plan: The most popular choice as it offers the best value; adding email and text alerts, limited home automation, and light control. With this, you can remotely protect your home and control your lights at the same time. Ultimate Plan: Perfect for those who need a more serious surveillance system and more advanced home automation. Comes packed with everything included in the Protection and Interactive plans, but is further boosted with additional home automation and video surveillance capabilities (including HD and night vision). Everything is included – no hidden fees or surcharges – so it’s the most comprehensive plan. The side-by-side comparison chart below offers a review of Frontpoint’s plans and pricing. Take note, however, that this does not include details on their equipment options, which we are going to talk about later. They can help you customize your home security system to best meet your specific needs. Tip: If video monitoring is your top priority, consider going for the top-tier Ultimate Plan. If not, the Interactive Plan has all the home security essentials covered, including remote access and home automation. Below are the winning features you may want to know about the Frontpoint system. All of Frontpoint’s plans are completely wireless and come standard with cellular monitoring. The system has a control panel that communicates with the monitoring center via cellular uplink. Cellular is a wise choice because traditional wired systems can easily be disabled cutting the wires outside. With cellular, there are no wires. What’s more, you no longer have to drill into your walls and worry about power outages. Lastly, it runs reliably on the most basic cellular signal, so even if your 4G reception is very low at home, your Fronpoint system will still run optimally. Installing the Frontpoint system is easy. It’s completely wireless and will only take about 30 minutes or less to set up. The company will get you in touch with an activation rep who will walk you through the whole process. With that said, most people could set it all up without any assistance from a rep, and just call in when they want to activate it. The system will be pre-configured before it arrives to your home, making it foolproof. With the Interactive or Ultimate plans, you can have full control of your home security system even when you’re away from home. With your Internet-enabled smartphone or device, you can easily access your security system, including alarm history and visitor activity. Simply download any of Frontpoint’s mobile apps for iOS, Android, Blackberry, and Windows and you’re all set. Apart from this, you can add custom alerts as well as control lighting, thermostat, and security cameras in your home (available on Interactive and Ultimate plans). Now, you can protect your home even when you’re away from home! The patented Crash and Smash protection safeguards your home against burglars who may try to disable or destroy your security system during a break-in. Here’s how it works: when the Frontpoint system is enabled and detects motion, it will immediately go on alert status. The only way to promptly disarm the system is to enter your secret security code, so if it’s not properly disarmed and no other signal is received (like when the control panel is destroyed), the system will automatically assume a break-in has taken place and will immediately send a signal to the monitoring center. Additionally, the system will occasionally “ping” the alarm system to ensure that the connection to the monitoring center is active and functional. If there’s a connection failure, the system will go into “Not Responding” mode, although the local alarm will still work. Bottom line is… if a burglar breaks in and unplugs or destroys your Fronpoint system, it’s too late. The authorities have already been notified. 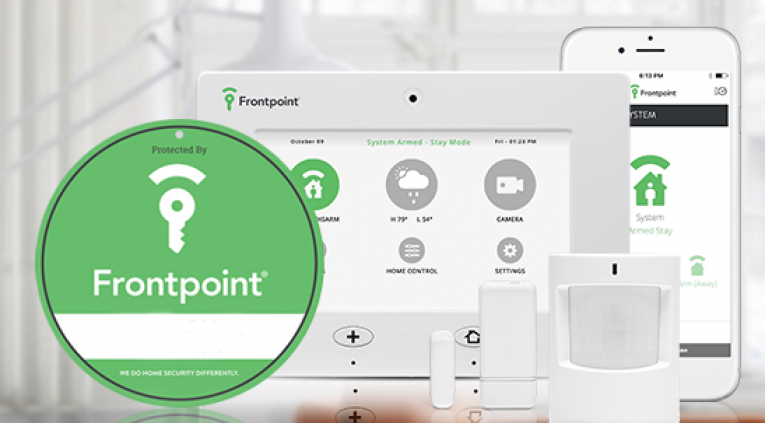 Unlike other home security providers that require you to pay extra on certain features and services, all Frontpoint plans come with life safety monitoring; including monitoring for security, flood, fire, and carbon monoxide. 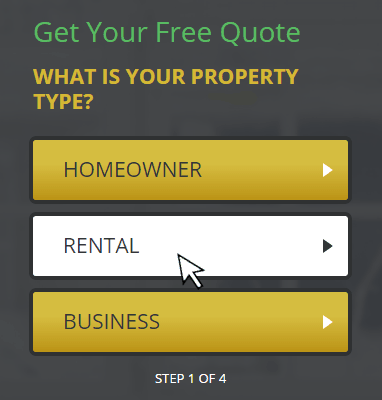 Frontpoint is hassle-free for renters. Let’s say you choose a 1 year contract, and your lease is up 7 months later. No worries – just pack up your equipment, move to your new place and set it up there. All sensors are peel-and-stick and can be removed without damaging any surfaces. The entire system is just as easy to remove from your home as it is to install. So when it’s time to pack up and move out, just unplug it and take it with you to a new location. In an industry that has historically been very inflexible on things like this, Frontpoint’s support for renters is refreshing. 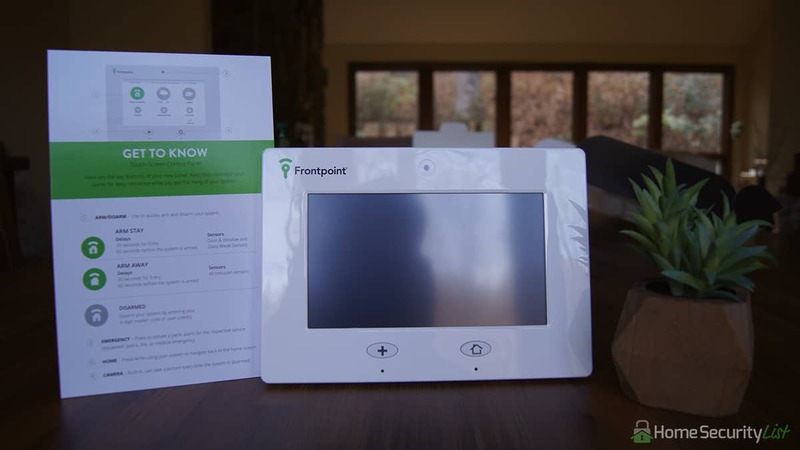 Because everyone’s home is different, your Frontpoint advisor is trained to help you choose what you need and don’t need in a home security system. Tip: Frontpoint regularly offers additional specials, so grab the chance and call them at at 1-877-959-9806. Now, let’s get on with the granular details as we take a closer look at the equipment. Frontpoint lets you choose between two control panels: the GE Simon XT Control Panel and the Qolysis IQ Touch-Screen Control Panel. The control panel serves as the “brain” of your home security system. The Simon XT control panel is included in all plans and serves as the main controller that comes equipped with a battery backup. This is where you manage and control all the other equipment and communicates back to the monitoring center via cellular uplink. It doesn’t send signal over your cellphone, however, so think of it as having a cellphone built into it – one that requires a much weaker signal than your regular mobile device. The Simon XT control panel is pretty basic, so if you don’t intend to add an image sensor and don’t require photos whenever you arm or disarm your system, this control panel will get the job done. I just think it’s ugly, and I want my home security and automation equipment to look cooler than that. That’s just my personal preference though. The Qolysis IQ control panel is an optional upgrade to the main controller – this is what we got with our system. If a touch screen panel is your cup of tea, then this option is available for you. It comes with a separate instruction manual which serves as a quick reference for you to get the hang of the system. It features a 7-inch LCD panel where you can manage both your home security and home automation systems. It also displays historical record of events, and can even speak the names of the security sensors. And if that’s not cool enough, it even tells you weather forecasting! The Qolysis IQ also comes with a built-in camera that lets you automatically save a photo when someone arms or disarms the system. Pretty nifty, right? Now, you can keep your system connected and your home safe with the combined power and simplicity of this modern panel. Which Control Panel to Choose? Depending on the plan you choose and the equipment you pair with your control panel (there are over 30 individual security sensors), may need to choose the Qolsys IQ panel. However, both panels offer the same reliability in notifications and alerts, as well as speedy communication with the monitoring center. Below is a side-by-side comparison of the two control panels. This should help you make a well-informed decision on the type of control panel you need for your home. Frontpoint Sensor Guide – Which Ones Should I Get? Frontpoint offers a vast array of security sensors; from door, window, and motion sensors to carbon monoxide, smoke and heat, and water and flood sensors. They even offer less common (yet equally important) types of sensors like glass break sensors and garage door sensors. All of these sensors are linked to the rest of your home security system. 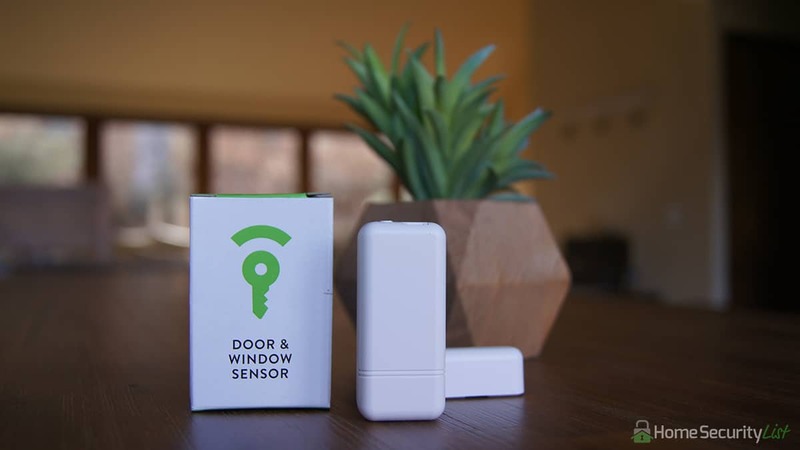 These security sensors are wireless devices that serve as your primary line of defense against burglaries and break-ins. You can place them at every point of access in your home. Once these sensors are triggered, you, the control panel, as well as the monitoring center will immediately be alerted. 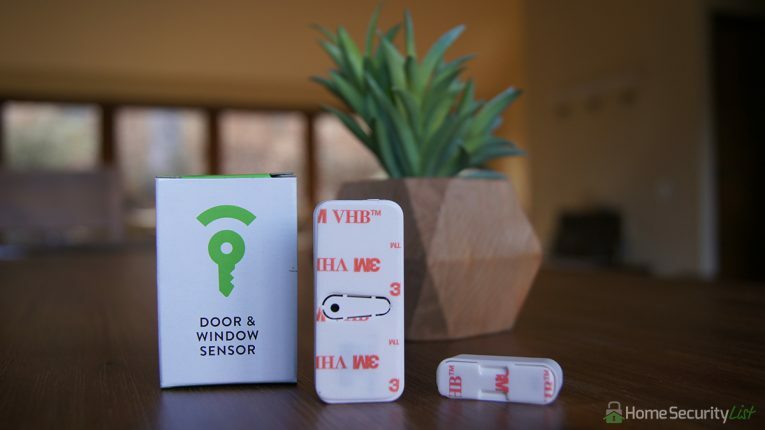 The Door & Window Sensors can be placed to monitor open and close movements on doors and windows. First-floor doors and windows are the first places you should consider adding these. If a door or window is opened, the sensor will immediately alert you of a possible breach. Tip: You can also place the sensors on drawers and cabinets, to protect valuables inside or protect kids against stuff they shouldn’t be messing with. Another recent addition are the Recessed Door Sensors, shown below. Just like the Door & Window Sensors, they protect important entry points in your home. However, the Recessed Door Sensors are smaller in size and are meant to be installed in doorframes – completely out of sight. The best part about this is that the bad guys can’t see them so if they try to break into your home and open the door, they’ll surely be in for a surprise! Meanwhile, if you have a big room with several windows, you might want to consider adding a Motion Sensor or a Glass Break Sensor to your home security package. The Motion Sensors are ideal for large, open spaces. It adds a layer of protection to your home by alarming you when something unusual is going on while you’re away. Using this will also greatly minimize the number of door and window sensors you’ll need, which is good for those who want to keep it simple. The Motion Sensor covers up to 1,000 square feet, and Frontpoint claims that it’s smart enough to ignore pets, which is important to avoid false alarms. That said, if you have small pets at home, we highly recommend you get the Glass Break Sensor as well. Of course, if you have a garage, you need to keep it safe and secure, too. By adding the Frontpoint Garage Door Sensor, you’ll never have to worry about whether or not you closed your garage door. If you drive away and forget to close it, the sensor will be triggered and you’ll get an alert right away. This nifty little sensor has you covered from every angle and will notify you when something isn’t right. With a Garage Door Sensor, you can get a custom email or text alert to notify you of an alarm or when you’ve left your garage door open. One of our top favorites is the Smoke & Heat Sensor. This specific part of the system is built to protect your home against fire and smoke damage, which is a vital safety measure you can take to protect your loved ones and your assets. 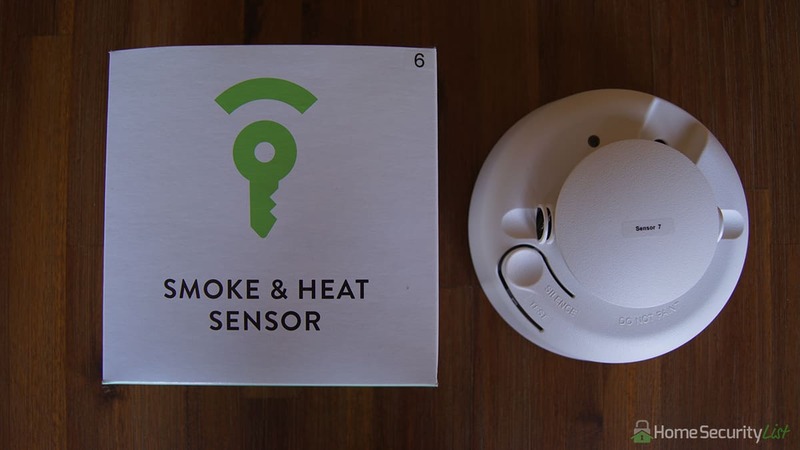 But unlike most of the competition, the Frontpoint Smoke & Heat Sensor not only detects smoke, but also sends an alarm when a room is getting too hot too quickly. It will be your first line of defense against life-threatening emergencies. And then, there’s another interesting type of sensor that Frontpoint offers – the Image Sensor. You need to purchase either the Interactive or Ultimate plan, as well as the Qolysis IQ control panel in order to get the Image Sensor. 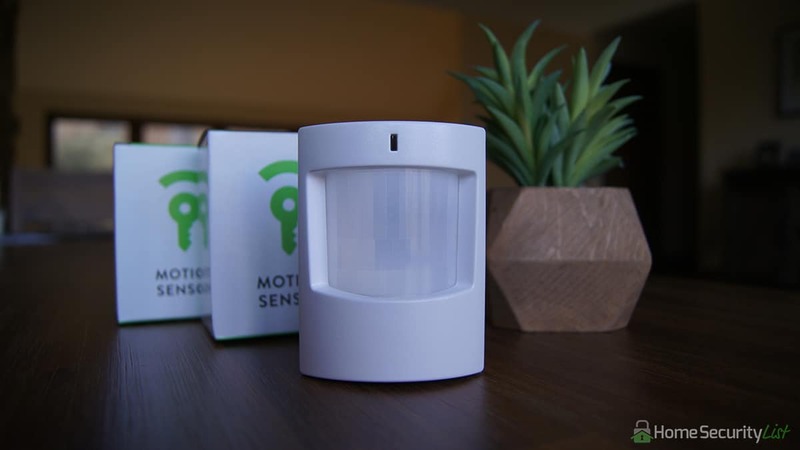 It’s a pretty cool add-on, and one that you might want to add to your package instead of the Motion Sensor. It detects various degrees of movement and when you’re away, it will send a colored image (black and white in lower light conditions) to alert you and ask for visual verification. But Why Choose an Image Sensor? Besides being a better option than the Motion Sensor, there are many other reasons you might want to go for the Image Sensor. For one, it’s a great way of capturing an image of what’s happening in your home while you’re away. Second, you need to get the touch-screen control panel but it doesn’t require you to purchase the top-tier Ultimate Plan. What’s more, it doesn’t require broadband access. So How Does the Image Sensor Work? Like the rest of the Frontpoint system, the Image Sensor is easy to install and is 100% wireless. 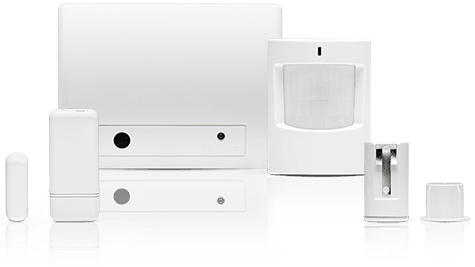 Once installed, it will work much like any other motion sensor. It detects motion and uses infrared LED flash to capture images whenever it detects motion. The camera’s maximum resolution is at 320×240 – a little static but still gets the job done; with night vision and infrared illumination included (up to 15 feet max). The sensor even comes with a wall mount kit so that you can place it creatively on any location in your home and monitor a wider area, up to 35 x 40 feet. Once the sensor captures an image, it will be sent to your touch-screen control panel and to the monitoring center. Of course, you can set up custom email and text alerts that will include an image of the event so you can assess the severity or lack thereof. But even though the sensor is sensitive enough to protect your home, it’s still pet-friendly. Small pets weighing less than 40 pounds won’t trigger the system so you can avoid false alarms. As you can see, Frontpoint sensors have all your home security needs covered. They’re relatively inexpensive and they’re a super-effective way to keep your home safe. The average cost for each sensor is around $33, but again, you may be able to get a few freebies simply by calling Frontpoint at 1-877-959-9806 and/or with your initial equipment credit. Perhaps the only thing that’s lacking here is a medical alert monitor which could be useful in homes with kids or older adults who are at a greater risk of falls or other medical emergencies. Other than that, everything about the Frontpoint system is incredibly amazing and easy to set up. You can have the control panel pre-configured and all you need to do is to plug it in. For the sensors, simply peel off the double-sided tape at the back of each sensor, stick them to the wall (or wherever you want to place them), and you’re all set. Once the system is complete, you can call a customer rep who will verify everything is working and activate the system. For a completely fool-proof, tamper-proof, smash-proof, and proven home security system, Frontpoint offers remote control over video surveillance. That is, if you purchase their top-tier Ultimate Plan. 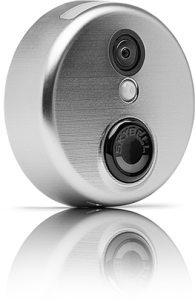 You can choose from three cameras: Wireless Indoor Camera, Wireless Indoor Camera, or the Wi-Fi Doorbell Camera. What could your pets be doing while you’re away from home? Are the kids doing their homework instead of just watching TV? With Frontpoint’s Wireless Indoor Camera, you’ll finally get an answer to those nagging questions. 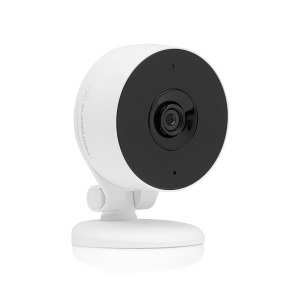 The Wireless Indoor Camera comes with a night vision feature and infrared technology, and boasts a 1280x800p HD resolution. The viewing range is up to 20 feet, making it an effective tool for monitoring single areas of your home like the living room and kitchen. The camera is also motion-activated and can even back up all motion recordings via cloud. If that’s not enough, the Wireless Indoor Camera also lets you live stream footage from your home to any PC or smartphone – anytime and anywhere. When the system detects motion and records a clip, it will then send you an email or text alert so you know who’s around. Who said you can’t be in two places at once? The Frontpoint Wireless Outdoor Camera is much like its indoor sibling, except that it’s specifically designed to withstand even the harshest elements of outside life. 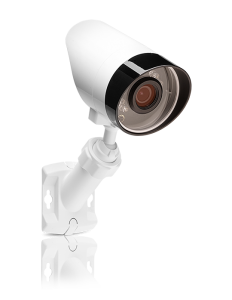 With its robust build, the Wireless Outdoor Camera is completely weatherproof, can take up to 122 degrees of intense heat, and can withstand sub-zero temperatures. The camera also has a wider viewing range, with up to 40 feet viewing distance, even at night. The Wi-Fi Doorbell Camera is the newest addition to Frontpoint’s lineup. Unlike your average doorbell, this sleek and capable little device serves to let you know what’s going on outside your door – even when nobody’s home. It’s built with a motion sensor and a 1080p HD camera with night vision capability. And like most of the other cameras in the package, it requires Wi-Fi connection and the top-tier Ultimate Plan. This way, the Doorbell Camera can have access to cloud storage. What makes the Frontpoint Wi-Fi Doorbell Camera so incredible is that it can record motion using two triggers. It records when motion is detected, as well as when someone rings the doorbell. What’s more, it has a nice two-way talk feature so you can talk (if you want) to your visitor before striking up a face-to-face conversation. Now, you have the power to control the interaction! As a bonus, the Doorbell Camera also has a live streaming video feature that you can view at any time. This way, you can capture all activity. Looks like it’s time to replace that old doorbell of yours! Apart from the control panel, sensors, and cameras, Frontpoint offers full home automation to those who will purchase the Ultimate Plan. With this, you can automate the locks, lights, and temperature in your home. While the Interactive Plan lets you automate your lights and gives you access to remote monitoring, the Ultimate Plan gives you full access to all home automation features. It’s a smart system that helps you set rules and even sends you reminders. It even comes equipped with Geo-based technology that senses your presence. For instance, it can sense if you’ve left the house without arming the security system, and will remind you. It can also sense if you’re close to home and will go as far as adjusting the thermostat before you arrive. It’s that interactive! One interesting thing to take note here though is that, while Frontpoint supports a variety of home automation options, it doesn’t sell all the equipment needed to support these options. This is a good thing for me because their top priority is to provide solutions to people whose priority is to make their home smart. They give suggestions to their clients without being greedy and forcing them to buy the equipment needed through them. Instead, they use an open home automation standard to allow their devices to work with thousands of other products. Frontpoint Security uses cutting-edge Z-Wave technology, giving you several options for home automation equipment, including Light Control and Thermostat. We’ll talk more about their automated locks below, as well. With the Ultimate Plan, you get to take advantage of Frontpoint’s lock automation capabilities, as well. Automated door locks are an incredibly handy form of home automation because with it, you’ll never have to pass out keys to your home ever again. And with that, you’ll never have to risk losing them, being locked out of your home, or even worry about where to put the keys when you leave. 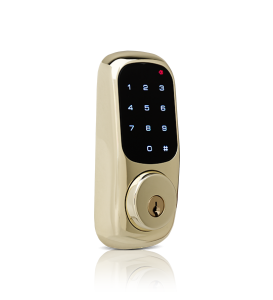 With lock automation, you have the power to control your home’s locks using your smartphone with the option to use the Keypad Door Lock, especially when you don’t have your phone with you. You’ve probably heard about some people buying security systems with lengthy contracts and by the end of it, what they have is an obsolete piece of junk. Even worse, some companies force you to buy their brand of equipment. It’s bad business for customers to be tied to a company’s innovation (or lack of it) and they’re forced to pay whatever price they want. But with Frontpoint, it’s an entirely different story. They’ve actually opened up their system to other devices. For instance, they do sell their own Smart Lock, but you can use any Z-Wave compatible smart lock you wish with your FrontPoint system. 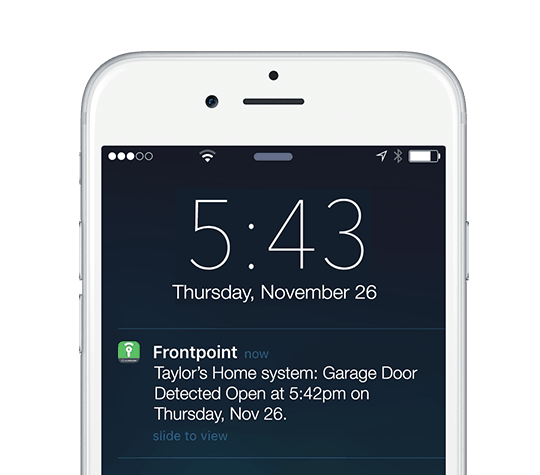 Frontpoint’s mobile app and web app provide easy, intuitive remote control of your home security system. Wouldn’t it be nice being able to arm or disarm your system from anywhere without the need to key in a code? Be it push notifications, email and text alerts, or setting up a Geofence, the FrontPoint mobile app has got you covered and it’s free to download on the Apple Store and Google Play. The app is also available for Blackberry users, and there’s a native app for Windows Phone, Kindle Fire, and Pebble. And if that’s not enough, the app is also available for wearables like the latest Apple Watch. With this app, not only will you be able to view security cameras remotely, you can also control lights, temperature, and locks in your home. *The Simon XT Control Panel comes included in all plans. The Qolysis IQ Touch-Screen Control Panel is available for a small upgrade fee. Frontpoint is a real MVP when it comes to customer support and service. It’s their top priority and they’re willing to do everything to maintain their stellar reputation, which really helps them beat out giants like Comcast Xfinity Home who are infamous for poor customer service. The company holds a solid A+ rating with the Better Business Bureau (BBB), with thousands of positive reviews and customer feedbacks online. Each of their package comes with a number of helpful instruction manuals so you can easily get around with each part of the security system. And if that’s not enough, they also offer a wide array of online self-help tutorials. They put everything out there to make installing and setting up the security system a breeze. There are no hidden fees, no surprises, and definitely no trick contracts. They are what they say: “Reliability at the right price”. Tip: If you’re still a little unsure about committing to Frontpoint’s 36-month contract, we recommend you take advantage of their 30-day risk-free trial. You may have to pay upfront for monitoring services and any additional equipment you wish to try but if you find they’re not the ideal solution for your home security needs, you can simply return the system – 100% money-back guarantee! Transparent pricing. Get the same bill every month with no surprises and no hidden fees. Equipment costs can get pretty expensive if your credit score don’t qualify for their special discounts. Of course, it’s normal to find some complaints here and there no matter how great a job Frontpoint does. In my pre-purchase research, I did find some customers who complained about receiving a bad piece of equipment, but that’s quickly resolved by Frontpoint when they send new equipment for free with fast shipping. Another type of complaint I saw online involved the batteries in some sensors dying just a couple months after setting up the system. However, Frontpoint quickly sent them plenty of new batteries. With other companies, this kind of thing is on you. But as I’ve mentioned already in this review of Frontpoint, a big part of their marketing strategy is to go above and beyond with customer support. Frontpoint has the right things going for them, from competitive pricing to generally positive customer feedback. Today, the brand is known for their high customer satisfaction ratings, excellent customer service, and their stellar lineup of DIY user-friendly security solutions that just work. The more we live with our system at home and review Frontpoint against other home security companies, the more we get to understand why this company has grown so fast in such a competitive industry. In their annual customer survey, 98% of customers recommended this product. Considering all the other options you have out there, Frontpoint is our top pick again in 2017. Easy To Install – no drilling or hammering needed. Flexible DIY and professional install options. The customer decides whether they want to set up the equipment themselves or pay for it to be done. No salespeople in your home, ever. Super-Modern Technology: Frontpoint uses only top of the line equipment. 96% of customers recommend Frontpoint. The majority of their customer base has had an overwhelmingly positive response. Frontpoint goes the extra mile to make things right for their customers. Rated A+ By The Better Business Bureau for over 7 years. Becoming a dad ignited my interest in home security. I started with security systems and quickly fell in love with the fast-evolving internet of things (IoT). I love to review home security and smart home products, and learn about new technologies in the IoT space. FrontPoint vs. Lifeshield–Which Do You Choose? Frontpoint Security vs. LiveWatch – Who Wins? Frontpoint vs. Vivint: Who Wins? HomeSecurityList delivers unique home security reviews and tips to thousands of readers every day. Our goal is to help you protect your stuff, yourself and your family. To keep this valuable service free, we generate advertising revenue from affiliate links in our content. We take pride in our reviews: All rankings are based on the product review criteria below.